Fuelled by the affordable housing shortage on Skye, an enterprising couple in Sleat have designed and built their own solution. Beth Maiden and Emma Appleton moved to Skye from Manchester in January 2016 and struggled to find a permanent home, having moved several times since then. They are currently staying in Teangue. 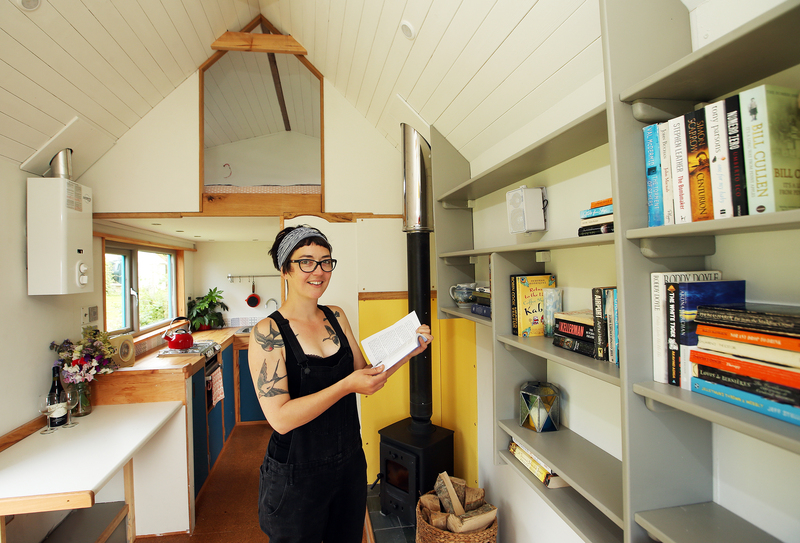 In an attempt to solve their problem, Emma, a carpenter to trade, started to build a mobile home — marketed as a Tiny House — initially at Achnacloich. It was then moved to Ardvasar where it was fitted out. 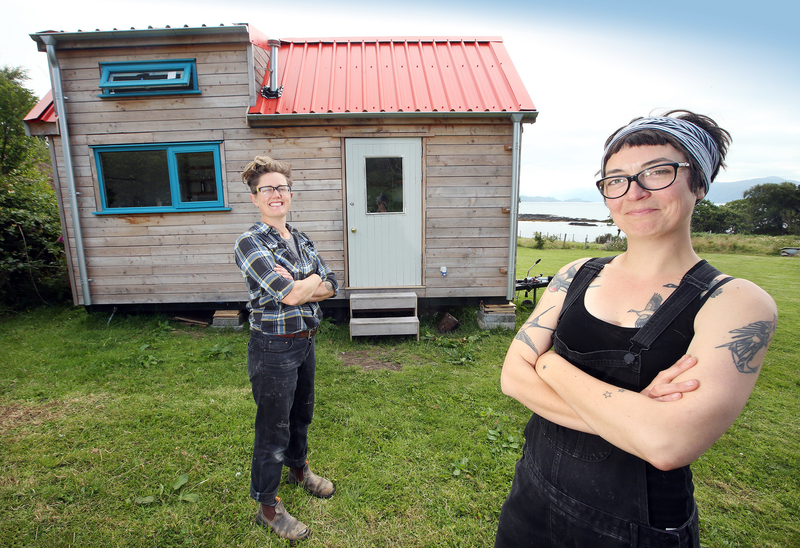 However, a lack of affordable house sites mean that Beth and Emma need to sell their Tiny House. Offers over £29,500 are now being invited. Measuring 18 feet long by eight feet wide, the house is mounted on a steel chassis. Weighing just under three-and-a-half tonnes, it cannot be towed by an ordinary car. Emma said: “The whole thought behind this house was that as many of the materials as possible would be from Skye. The kitchen worktop is from woodland down the road, near Ostaig. “When I got it I thought it was just ordinary beech. But when I planed it this unusual grain came out and and apparently it is only found on beechwood grown on Skye. It is something to do with the minerals in the soil. “The main frame is from windblown Scots pine and the cladding is larch from local woodland. The doors have been refashioned — we got those from ceramicist Kat Lenz’s old kitchen. It’s 1950s plywood, which I love. The internal frame is local oak wood, but the floor is made up of cork tiles from Portugal. 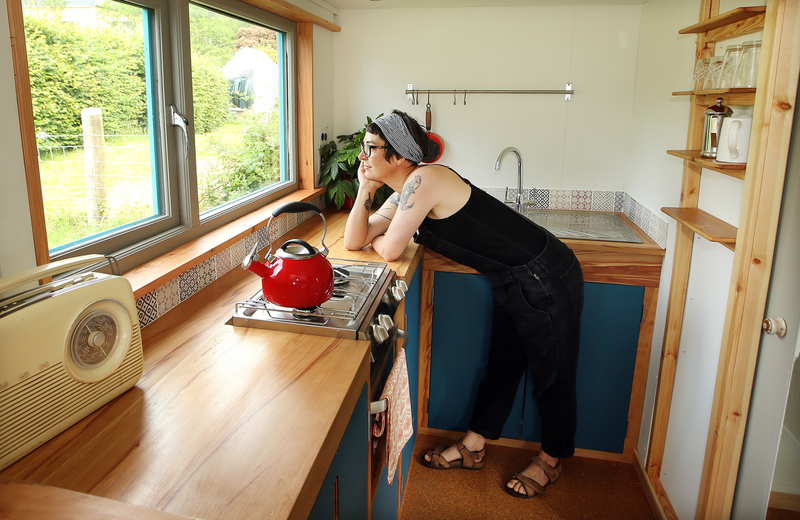 Hot water is obtained from LPG fuel and electricity from either mains or 12-volt battery, although the Tiny House is equipped to take solar panels. A wood stove is also fitted.